Whether the food and beverage industry or another commercial enterprise, every industrial facility has at least one room, production area or other spot where the floors are required to withstand heavy loads, high impact or extreme abrasion. Without the proper industrial heavy duty flooring system, your concrete slab surface can crack, buckle or deteriorate under heavy traffic, high impact or extreme abrasion, developing marks, fractures or failures that require costly repair. Many standard concrete floors don’t always bear heavy loads or withstand severe abrasion and impact, and the concrete underneath will continue to show signs of damage if left without the right protection. Industrial heavy duty flooring systems from Surface Solutions give a concrete floor the strength it needs to stand up to repeated and constant abuse from fork lift traffic, pallet jacks and heavy skids that can destroy concrete and concrete coatings. By installing one of our heavy duty flooring systems, you give your traffic surface the protection it needs to endure extreme pressure and heavy use for the longest time without repair. These industrial concrete floor systems help ensure that your slab is strong enough for harsh conditions. You rest assured the integrity of your flooring is sound so you can get back to business. 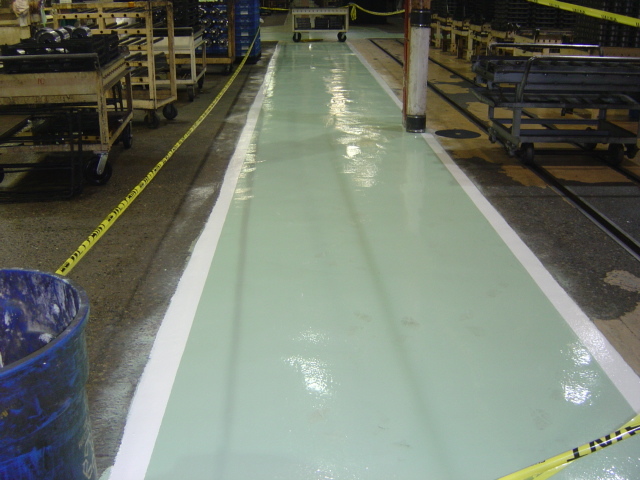 An integral part of your facility, heavy duty industrial flooring and protective coatings not only represent a substantial investment, they provide the foundation of your business. Choosing a light duty floor coating for a heavy duty environment puts that concrete slab, your investment and your entire facility at risk. If the protective coating or concrete floor fail to bear heavy loads or withstand severe abrasion and impact, showing signs of damage, you may have no choice but to write up an order for costly, time-consuming flooring removal, concrete repairs and floor system re-application –before their time. Don’t take that chance. Industrial heavy duty flooring systems from Surface Solutions offer the kind of super tough protection you want and the environmentally friendly protection you need. They are designed to deliver durable, wear resistant and easily maintained surfaces for customers working in production plants or heavy industry. Time-proven flooring formulations stand up to heavy forklift, pallet truck and pedestrian traffic while at the same time perform with impressive resistance to aggressive chemicals, solvents and cleaning agents. Many systems also provide protection in areas subject to temperature swings and thermal shock. What’s more, Surface Solutions’ industrial heavy duty flooring systems offer everything from textured finishes for enhanced slip resistance to UV stability to maintain color vibrancy. Additional flooring and coating options are available in an anti-static grade to protect sensitive electronic equipment and safely ground any electrostatic charge. Plan your project today with a free quote from Surface Solutions. We provide expert consultation and installation along with a full line of industrial heavy duty flooring and coatings in addition to other high performance flooring systems tailored to the food and beverage industry. We are committed to 100% customer satisfaction on every project. Call today for a free quote (866-858-4080).